The disciples are discouraged — even dismayed. They thought they were following a Messiah into a glorious kingdom. But then Jesus told them that he was going to his death. Where was the glory they hoped for, the kingdom that Jesus seemed to promise? Jesus needed to offer the disciples some hope for the future, and this is what comes next in the story. Jesus told his disciples, “Truly I tell you, some who are standing here will not taste death before they see that the kingdom of God has come with power” (NIV 2011 throughout). Jesus assures them that the glory of the kingdom will indeed come — and it will be seen before the disciples die. The disciples had already seen some of the power of God’s kingdom. Whenever Jesus cast out demons and healed the sick, the power of the kingdom was at work (Matthew 12:28). The disciples saw the power of the kingdom on the day of Pentecost (Acts 2:1-4). They saw it in miracles, and in the spread of the gospel all the way to Rome. But Jesus is referring to something else. His promise is found in Matthew, Mark, and Luke, and in each account, it is immediately followed by the Transfiguration, in which three disciples had the privilege of seeing Jesus in a special glory. In all three Gospels, we are told that the Transfiguration happened about a week after the prediction—the saying and the fulfillment are tied together by this literary technique. “After six days Jesus took Peter, James and John with him and led them up a high mountain, where they were all alone.” Tradition says that this was Mount Tabor, but it is only 2,000 feet high. Mt. Hermon may be a better candidate, since it is the tallest mountain in the area (9,000 feet), and Caesarea Philippi is at the base of Mt. Hermon. Peter, James and John were the disciples closest to Jesus. They also seem to have been the most ambitious — Peter was the most outspoken, and James and John wanted positions of honor when Jesus came in his glory (Mark 10:37). These three may have needed the most reassurance that something better would come after the persecution. Were Elijah and Moses resurrected, or was this just an “appearance”? Matthew 17:2 says that Jesus’ face “shone like the sun.” Was it a vision, or was Jesus really changed? We do not know. Why Moses and Elijah? That is more easily answered. Jews respected both of them highly, and they represent high points in Israelite history, corresponding to the Law and the Prophets. What were they talking about? Luke 9:31 says that they were discussing Jesus’ “departure which he was about to bring to fulfillment at Jerusalem.” They were talking about his death. Did Elijah and Moses know the manner and purpose of Jesus’ death, or were they asking Jesus to explain it to them? Apparently it is not important that we know. A week earlier, Peter said that Jesus was the Messiah. Now, he uses the lesser title “Rabbi.” Which title is most appropriate? We will soon have an authoritative answer! Why did Peter talk about shelters? In a state of glory, why would anyone need a shelter? Perhaps Peter was thinking of the Festival of Tabernacles, which many Jews associated with the arrival of the kingdom. Perhaps the shelters were an invitation for the prophets to stay a while. Something even more astounding happened next. “Then a cloud appeared and covered them, and a voice came from the cloud: ‘This is my Son, whom I love. Listen to him!’” The cloud was not just above them — it “covered them” in the sense of covering them up, as a dense fog, blocking their view. And God tells us what is important: Jesus is the Son of God, loved by God, speaking the words of God. Even when the greatest prophets from Israel’s history are present, the disciples should listen to Jesus. Jesus is greater even than Moses and Elijah, and therefore greater than the Law and the Prophets. If he says that he is going to be their Messiah by dying in Jerusalem, then they should pay attention to what he says. “Suddenly, when they looked around, they no longer saw anyone with them except Jesus.” Peter had hoped to prolong the moment, but it was over. The event was not to get them in touch with past prophets, but for them to be more dedicated to the leader they had, because he was more than a prophet — he was the Son of God, and God had just validated the path that Jesus was on. The glory they saw in Jesus no doubt encouraged them that the glorious kingdom would be a reality. But it was not just a future reality. Jesus had been the beloved Son of God all along, and his disciples should accept his teachings, even if they are the opposite of what they wanted and expected. Since he is the beloved Son of God, the disciples could be sure that glory would follow, even if dark days lay in the immediate future. 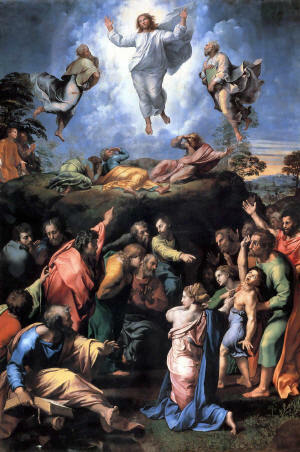 The Transfiguration also shows that God’s kingdom transcends human kingdoms. God’s reign is not just a bigger and better empire, and the leaders in the kingdom are not just kinder and stronger versions of Roman or Judean kings. The transformed face and clothes of Jesus show that it is far different; it is not just a continuation of normal history. Indeed, when the disciples catch even a small glimpse of the glory, they are frightened and don’t even know how to speak intelligently. They had only a glimmer of understanding of what the kingdom really is. So what should they do? They should listen to Jesus, get behind Jesus and follow him. They should not take matters into their own hands, because their efforts are as useless as making shelters for glorified beings. Jesus had predicted his own death and resurrection, but the truth was so contrary to what the disciples expected that they couldn’t understand the plainest of words. It was only after Jesus rose from the dead that they could begin to understand — but until that understanding came, they would not be able to tell the story right. So Jesus told them to keep it a secret until the time was right. The Transfiguration gave them a glimpse of the glory that Jesus had, and the glory that he would share with all who took up the cross to follow Jesus into the valley of the shadow of death.